Figure 5.2. Yellow-white areas of abundant calcification can be seen on the red maternal surface of this normal term placenta. It will also be present within the parenchyma, giving a gritty sensation and sound on cutting. Grossly visible calcification is quite variable, but tends to increase with advancing gestation. 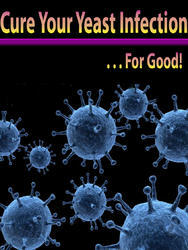 It is not associated with disease, even if large amounts are present. Figure 5.3. The parenchyma of this immature (24-week) placenta shows no calcification and is relatively pale red. Color of the villous tissue is largely related to hemoglobin content. Thus mature placentas have a darker coloration than immature ones (compare also with Figure 1.6). Figure 5.4. The maternal surface of this term placenta shows a rough line from 11 o'clock to 5 o'clock demarcating two zones of differing color. This is an artifact, created by the positioning of the fresh placenta in the container. The darker portion was folded under the slightly paler area. Some of the color difference may be related to dependant congestion. Additionally, the paler red portion was also more exposed to the air and has more oxygenated hemoglobin, an effect common in packaged ground meat. Figure 5.5. In the central portion of the villous tissue there is a rounded depres-sion.This is a site of maternal blood injection into the intervillous space, a normal finding. The placenta is also a very deep red color, which is usually due to congestion of fetal villous vessels with blood. This is commonly caused by early cord clamping, and the infant may be hypovolemic. 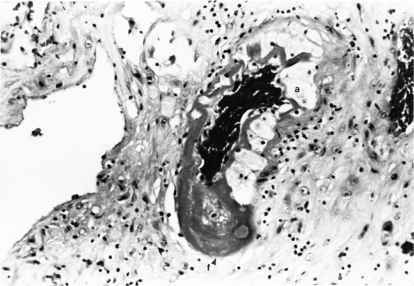 Dark placentas also occur in some cases of maternal diabetes and with certain microscopic villous vascular abnormalities (e.g., chorangiosis). Such villous tissue may feel unusually soft, particularly in the abnormal deep red placentas. Figure 5.6. 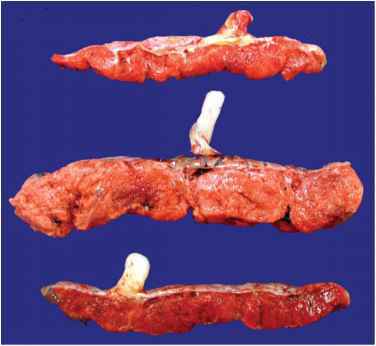 A transverse slice of a hydropic placenta (middle) is compared with an age matched preterm (top) and normal term placenta (bottom). Extreme pallor is usually present in hydropic placentas, due to factors including fetal anemia, villous edema, and inappropriately immature villous histology. Such placentas are large and thick with coarse villous structure. Figure 5.7. A close view of a fixed piece of a hydropic placenta better shows the coarse villous structure. Such placentas may be extremely friable. The pallor here is marked. Placentas also appear pale if they have lost most of their fetal blood either before, during or after delivery (draining the cord, villous disruption). In contrast to hydrops, the gross villous size is normal in such cases. Figure 5.8. Microscopically, these hydropic villi show unusually large size for this near full-term gestation (compare with Figure 2.11, same magnification). The stroma is abundant and edematous. 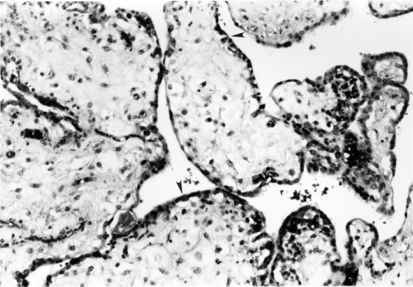 The covering trophoblastic layer shows few syncytial knots, and cytotrophoblasts are easily identified (arrowheads), features of abnormal immaturity. There are no specific diagnostic features. The infant showed premature closure of the ductus arteriosus. True villous infarcts are quite common and usually distinctive on gross exam. These are villous regions that have lost their maternal blood supply. They are based on the maternal surface and have rather linear defined margins (Figure 5.9, Figure 5.10). Infarcts are more solid and feel firmer than the adjacent tissue. 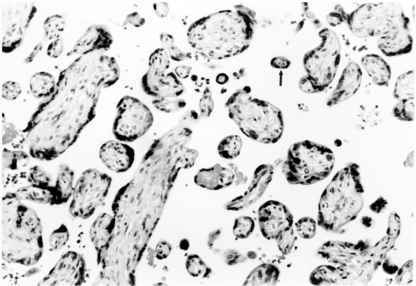 They appear granular due to the remaining collapsed villi in varying stages of degeneration. Over time the color changes from red to white. Cystic change and hemorrhagic regions may be seen in infarcts. Infarction is seen most commonly at the placental margin where there is less blood flow.A small (1-cm) lesion of this nature is usually insignificant (Figure 5.11, Figure 5.12). Central and large marginal infarcts suggest maternal vascular disease, particularly if they are extensive or in placentas from preterm births. 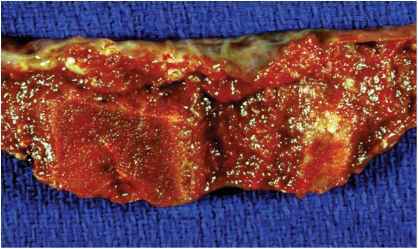 Examination of the entire sliced placenta is often a good means to assess the extent of villous damage in such cases (Figure 5.13). Fetal problems such as growth restriction are often present with 15% or more infarction. Since infarcts collapse and shrink over time, they actually represent a greater portion of villous tissue than their dimensions would imply. The fetus can survive the loss of more than 50% of its placenta if the increase is gradual. Figure 5.9. The maternal surface of this 30-week placenta from a mother with severe preeclampsia reveals many infarcts, yellow polygonal areas which feel quite firm. 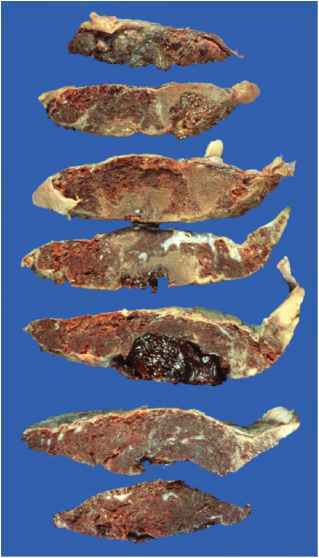 The villous tissue is dark and mature appearing (see Figure 5.2), and the placenta was quite small. Areas of fresh retroplacental blood clot are also identifiable at 2 (arrow), 4, and 11 o'clock. Placentas with substantial infarction frequently show premature separation, both processes reflecting maternal vascular disease. Figure 5.10. Cross-section of a multiply infarcted placenta highlights two central lesions. Infarcts are usually well demarcated, square and based on the maternal surface. There is a spared region under the fetal surface due to cross-circulation between districts. 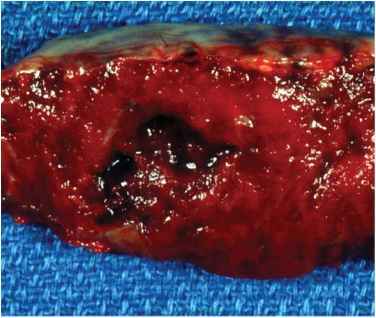 Villous collapse leads to the granular appearance, while color reflects the age of the lesion and degeneration of blood. The dark red lesion is relatively recent. The smaller, paler one has been present longer. The exact time course of these changes is unknown. Figure 5.11. A fresh marginal infarct is present at the edge of this placenta (*s). It is minimally different in color, but is more solid and compact. Infarcts at the margin are triangular and often extend to the fetal surface. Such very recent infarcts are often better palpated than seen. Figure 5.12. Old marginal infarcts are very common, reflecting the poor perfusion near the edge of the placenta.A small lesion is of little significance.This older lesion has lost much of its color. It can be seen to extend on the maternal surface. The placenta shown is thin and the infracted region occurred in a partial lobe. Infarction is particularly common in the periphery of irregularly shaped placentas and relatively large lesions may be seen in otherwise normal placentas. Figure 5.13. The extent of infarction in a placenta can often be better defined if serial slabs are observed simultaneously. As present here, there is often an admixture of areas with infarction of varying ages, some of which is related to premature separation and retroplacental hemorrhage. 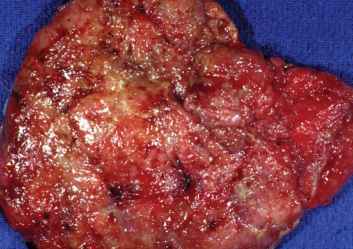 In this partially fixed placenta, at least 30% to 40% is involved by the lesions. of staining and fibrin is deposited (Figure 5.14). Associated ischemic villous pathology is seen adjacent to infarcts and often diffusely in the placenta (Figure 5.15). Maternal vascular lesions are sometimes found in attached decidua (Figure 5.16). Vascular disease in the placenta associated with growth restriction and preterm delivery. Figure 5.14. 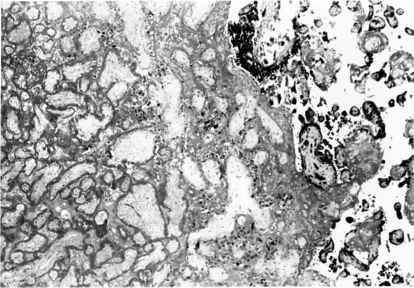 Histology of an old infarct reveals ghost outlines of villi enmeshed in fibrin. Nuclear staining has been lost in all the trophoblast and most of the remainder of the villi. Viable small villi are present adjacent to the infarct on the right. Figure 5.15. Villous structure is often altered in noninfarcted areas of placentas associated with maternal vascular disease. The villi are smaller than expected for gestation with dark smudgy syncytial knots, a change sometimes called "accelerated maturation." 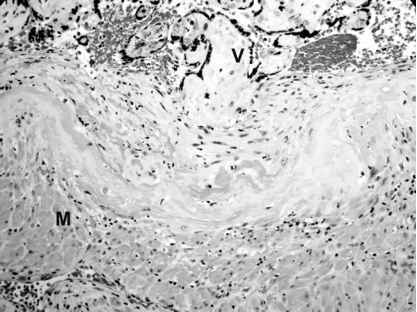 Extremely small villi may be present (arrow). Figure 5.16. Decidual vessels at the base or in the attached decidua may show vascular lesions characteristic of maternal hypertensive disease. This vessel from a severe preeclamptic shows atherosis, a vasculopathy characterized by dense fibrin deposition and lipid-filled atherotic cells (a). Marginal infarction is overdiagnosed by many observers. Fibrin deposition and necrotic decidua at the edge may be confusing (Figure 5.17). Even occasional small (<0.5 cm) gross infarcts are physiologically insignificant in most cases and the extremely small ones (1mm-2mm) do not warrant individual description. Figure 5.17. There is a yellow-white, somewhat triangular lesion at the margin of this placenta. This is not a marginal infarct. It is shiny and does not have the characteristic solid granular appearance. 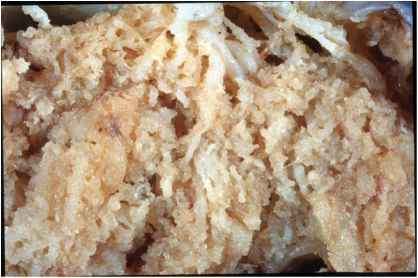 This is fibrin deposition and there is decidual necrosis on the adjacent membranes (arrow). These processes are far more common than true infarction at the placental margin. Blood clots on the maternal surface of the placenta are caused by bleeding from decidual vessels in areas of premature placental separation and may relate to significant maternal or fetal disease. Trauma, hypertensive disorders, chorioamnionitis, smoking, and possibly cocaine use have been associated with retroplacental hemorrhage. It is preferable to use descriptive terms for this process rather than "abruptio placenta," a clinical expression implying pain and bleeding. Although some retroplacen-tal hemorrhages correspond to clinical abruptio placenta, many grossly identified hematomas are unsuspected. Very recent and at times massive placental separation often has little, if any, gross or histologic change. The placenta may appear to be normally separated. Excessive blood clot received with a specimen, particularly if somewhat granular and formed, may be the first and sometimes only clue to retroplacental hemorrhage. 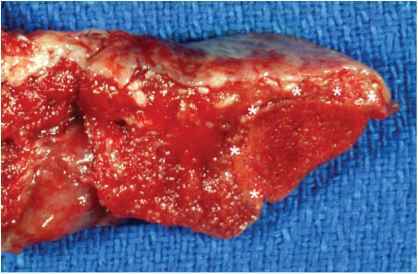 Most genuine fresh retropla-cental hemorrhages are at least slightly adherent to the maternal surface, as compared with gelatinous postpartum clot. What is edema villus ? What does gritty placenta and hypertension mean? Can anemia cause gritty placenta? What does a calcified placenta look like?